As part of our preview season for Ixalan, we are going to take a deeper look at some of the cards previewed on our own homepage. Today, we'll be peering behind the scenes of the process that went into creating the design and art of Captivating Crew, which was previewed in Sam Stoddard's article today. 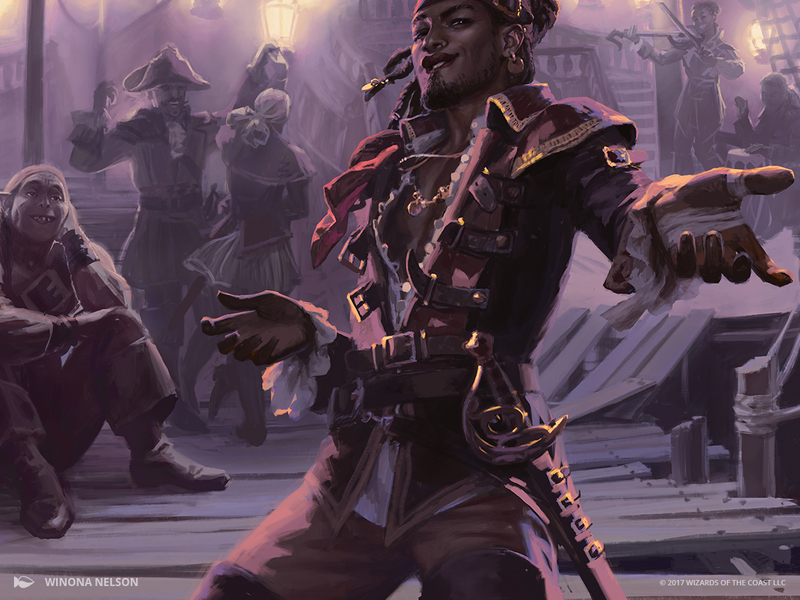 The ability on Captivating Crew is one we've seen as an enters-the-battlefield effect on several red creatures: Zealous Conscripts, Conquering Manticore, Molten Primordial, and more. But the inspiration for Captivating Crew was a card with this effect that sported an equally captivating figurehead: Enthralling Victor. The set team wanted to call back specifically to this fan-loved card, so they stuck with the four-mana cost and made a few design tweaks. First, they decided to upshift the rarity to allow for a splashier effect and bigger payoff. At rare, they felt that making the ability activated instead of triggered was reasonable and added a great amount of value. Furthermore, without any tap cost, the payoff of the ability continues to scale into late game where it can potentially be triggered twice per turn for devastating swings. Action: Show a handsome male Human Pirate, a dashing rogue rather than a muscle-man. He stands in a sort of flamboyant pose, extending a hand to the viewer as if inviting us to dance. We might see a couple behind him already dancing, and perhaps a musician as well. In addition, a male Ogre sits behind him, looking at him with star-struck admiration, as if hoping to be picked next for the dance. Note: This card is very similar to Enthralling Victor, and we're aiming for a similar sort of vibe to it. Clearly, she nailed it. This is a party I would definitely go to. The soft lighting from the lanterns and jovial nature of the background characters make the scene inviting enough, but the main Pirate's posture and expression really drive things home. One may come to wonder what happened to his hand . . . but the correct answer is clearly "Who cares?" Just accept his invitation and join the party!